Back in late April when I profiled publican Andy Duffy on the challenges of running your own tavern, we talked about the hope that the hours restrictions would be lifted on Duffy’s in a then-upcoming ABC Board vote. The restrictions have been a real hardship over the past five years since Duffy’s opening, causing him to lose out on providing drinks and nosh to the post-concert crowd, and there’s always been the worry that the limited hours might eventually sink the beloved neighborhood pub. Worry no more. Word from Duffy is that the ABC Board has voted to terminate the “voluntary” agreement, which means the restrictions will be lifted. 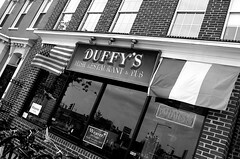 That gives Duffy’s the same hours benefit as other popular nightlife options in the area he helped to make popular. As a local resident and an unabashed fan of Duffy and his pub, I’m thrilled. The paperwork still has to go through (UPDATE 6:30pm: Official license has been received and new later hours will start this Sunday 7/10), but this is still great news and a sign that sometimes, being a true gentleman who perseveres does work out in the end. UPDATE 2pm: For more details on the actual ABC order, read on after the break. “The hours restrictions and other operating restrictions are no longer required, as Duffy’s was able to show there is no harm to the neighborhood in relation to: peace, order and quiet, residential parking and vehicular safety, or property values. Note, any request for outdoor cafe seating would have to go through a separate process. We’ll keep you updated as plans progress. Again, congrats to Duffy’s! A well-deserved Guinness is in order.